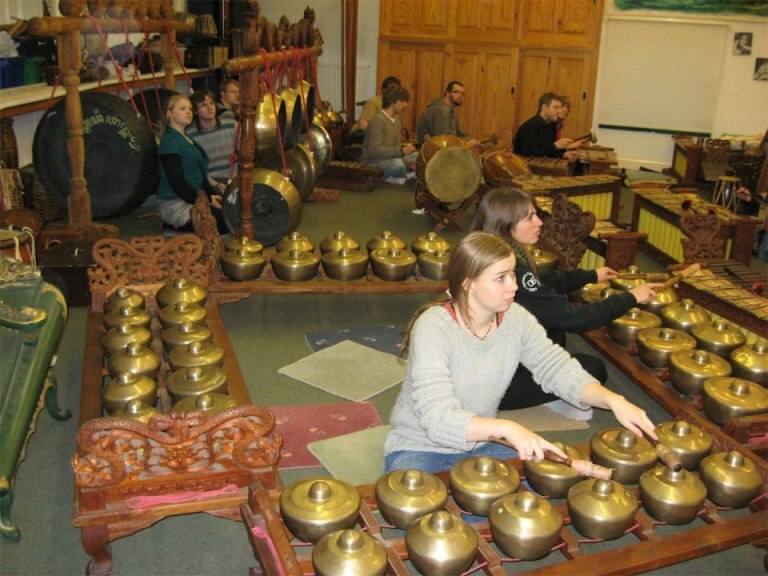 Gamelan is a musical ensemble that usually highlight metallophones, xylophone, drums, and gongs. The term gamelan refers to the instrument / tool, which is a unified whole that is realized and sounded together. The word itself comes from Gamelan Java language gamel which means hitting / beating, followed by an ending that makes it a noun. Gamelan orchestra mostly located on the island of Java, Madura, Bali, and Lombok in Indonesia in various types of ensemble sizes and shapes. In Bali and Lombok today, and in Java through the 18th century, the term is considered synonymous with the gong more gamelan.Preceded the emergence of gamelan with Hindu-Buddhist culture that dominated Indonesia in the early days of recording history, which also represents the original Indonesian art. Instrument was developed to shape up like this at the time of the Majapahit Kingdom. In contrast to the music of India, the only impact of the India-an in gamelan music is how menyanikannya. In Javanese mythology, the gamelan dicipatakan by Sang Hyang Guru in Saka Era, the god who controlled all the land of Java, with a castle on the mountain Mahendra in Medangkamulan (now Mount Lawu). Sang Hyang Guru is first created the gong to summon the gods. For a more specific message and then create two gongs, then eventually formed gamelan set.The description of the ensemble's first musical instrument was found in the temple of Borobudur, Magelang, Central Java, which has stood since the 8th century. Musical instruments such as bamboo flute, bells, drums in various sizes, harp, stringed musical instrument that is swiped and learned, is found in the relief. However, little is found elements of metal musical instruments. However, the relief of the instrument is said to be the origin of the gamelan.Tuning and making gamelan orchestra is a complex process. Gamelan using a four-way tuning, the slendro, slendro, "gamelan" (special area of ​​Sunda, or West Java), and "madenda" (also known as the diatonic, the same as the original minor scale that is widely used in Europe.Gamelan music is a combination of the influence of foreign art that diverse. Not regard the tone of Chinese musical instruments of Southeast Asia, drum band and move to music from India, bowed strings of the Middle East, Europe and even the military style that we hear the traditional music of Java and Bali today.The interaction component is loaded with melody, rhythm and timbre to maintain the glory of Balinese gamelan orchestra music. The pillars of this music brings together a range of rural community character of Bali is the typical order of music which is an inseparable part of everyday life.